The course starts with lectures from 7.15pm until 8.15pm on Thursday followed by practical sessions in the swimming pool from 8.30pm until 10.00pm. Finally there is a debrief and qualification book signing in the bar afterwards. For your sheltered water training in the club swimming pool, you will only need to purchase the basic kit (a dive mask and snorkel) to supplement the hired scuba kit. . There are a wide choice of masks and snorkels available, so we advise you not to buy anything until after the first introductory lesson where advice will be offered about the different types and how you can test your mask to ensure you have the correct fitting. Wetsuits may be worn for pool sessions if you own them, but swimming costume and a T Shirt will be sufficient. Following successful completion of theory lessons and pool work you will progress to open water lessons starting in a dedicated lake. The water is much colder than the swimming pool and is essential that you consider a dive suit necessary to keep warm. 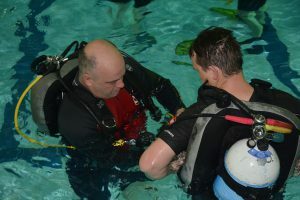 Most trainees opt to complete open water training in a drysuit which can be hired from local dive shops. Hood, gloves and sea fins will need to be purchased at this stage. Guidance will be provided during training. Your final qualifying dives usually take place on a weekend day boat so you will need to hire a second cylinder from the club or a dive shop. 6 x Theory lessons Thursday evenings from 7.15pm – 8.15pm in our lecture room at Bracknell Sports Centre. 5 x Sheltered water lessons follow from 8.30pm – 10.00pm in the Competition Pool. 4 x Open water lessons take place following successful completion of a written theory test and successful completion of pool sessions. 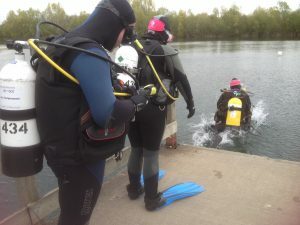 These begin in inland lakes of progressing depth – Wraysbury Dive Centre or The National Diving and Activity Centre. Final sea familiarisation dive(s) are arranged at the coast. Club kit is available to hire but you will need to purchase your own mask and snorkel. Pool fins are included in the hire kit but eventually you will need to purchase sea fins for your Open Water dives. If you hire or purchase a semi-dry you will also need diving boots. If however you opt to hire or purchase a dry suit the boots are integrated. Current hire and purchase costs can be found online or at local dive shops such as Divecrew , Slough Scuba or Divestyle. There are additional costs connected with the open water dives: entrance fees to training lakes (typically £10.00 – £18.00 per day) and boat charter costs (typically £50.00 – £55.00 per day to include two dives). You will also need to arrange and pay for your own travel and accommodation for weekend dives at the coast, which may involve Friday and Saturday night accommodation depending on tides and ‘ropes-off’ times. Please visit our calendar for date of the next course. Please contact training@bracknellscuba.org.uk if you would like to sign up.